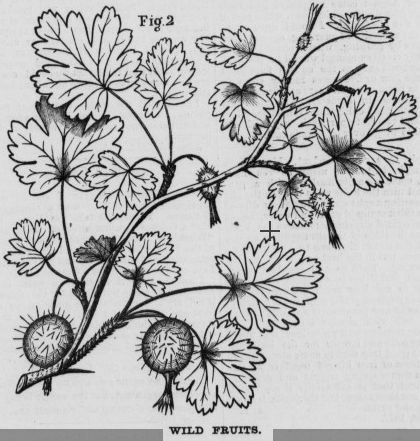 California gooseberry illustration from Pacific Rural Press (1873). I first ate wild gooseberries in the mountains of Oregon as a boy. Sometimes, when my dad and I went trout fishing or when we were staying in the mountains, my aunt would forage for wild berries to make fresh pies or jam. I ate myself sick in the woods on more than one occasion, shoveling down strawberries and huckleberries by the handful. They were smaller in size than their store-bought cousins, but they burst with superior flavor. Coastal southern California always seemed like a wasteland by comparison. Trout were small, few and far between. What few wild berries did grow in my local weed patch were sparse and puny. 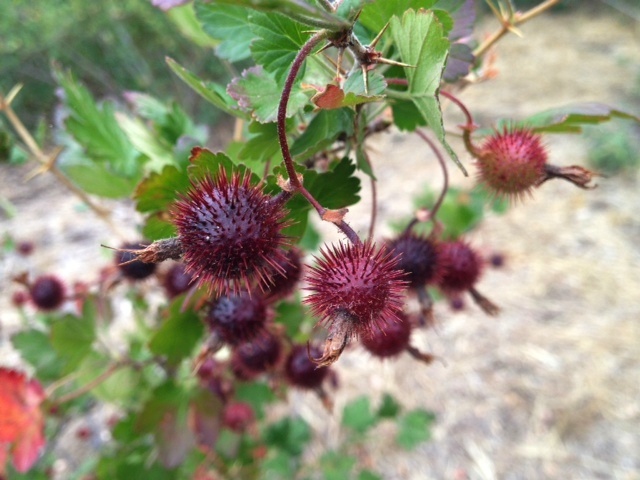 Not only were the gooseberries around Santa Barbara smaller, they were wrapped in an armored shell that bristled with an especially dense coating of evil looking spikes. 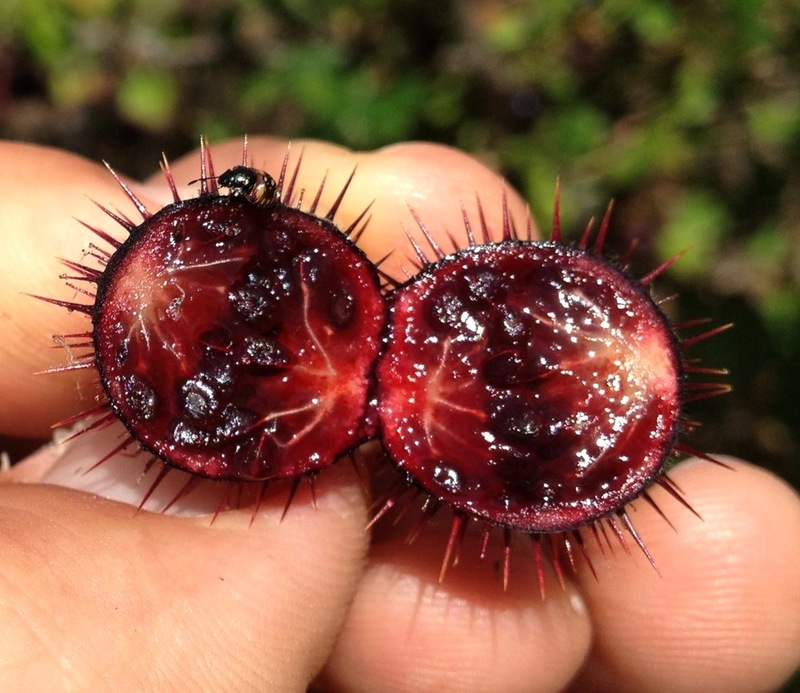 I don’t think I’ve ever seen a meaner looking gooseberry than those found in the southern Los Padres National Forest. 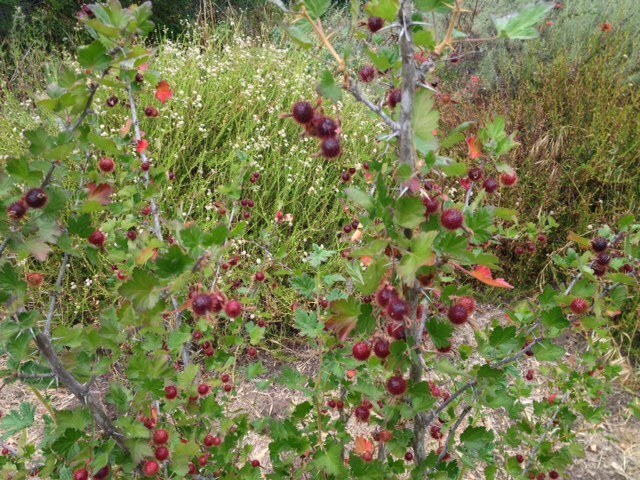 Gooseberries (Ribes menziesii) ripening in June in the Santa Ynez Mountains. A person today may still possibly receive some mild medicinal relief from the bark of a willow tree. Then again, they could just crack the lid on an ibuprofen bottle and swallow a couple of pills. Not all traditional wilderness knowledge is still relevant. I think, sometimes, that foraging around this here neck of the woods is an eccentric pursuit inspired by a romanticized view of the past. Nowadays foraging is a leisure pursuit of the well-off rather than an existential necessity of hardscrabble times. It’s largely wisdom long since rendered obsolete by the march of civilization, but I like to think some of it’s worth hanging on to. The Sisquoc River pioneers of Santa Barbara County would probably think it’s ludicrous to waste time and energy hiking into the woods to pick gooseberries, when today we have fully loaded supermarkets, refrigerated shelves stuffed with over-sized blueberries and gargantuan strawberries, and everything available on demand at all times of the year and most hours of the day. Wild gooseberries, I think pioneers would say, are too much effort for too few calories to be of much worth nowadays. But if the value is found in rare flavor rather than generic nutritional density, then a good ol’ fashioned gooseberry harvest may still be worth while. Gooseberries are rich in natural pectin which makes for exceptionally thick syrup and jelly without the need of added thickening agents. Gooseberries are a sweet-tasting wild edible I like to eat right off the plant even though each berry doesn’t offer much. I introduced my children to them when they were only a few years old, and while the novelty of tasting a wild fruit in the woods was initially exciting, their enthusiasm quickly evaporated. Gooseberries contain more spines and hard and bitter-tasting seeds than sweet juicy pulp. Having been raised on ridiculously large and sugary domesticated fruit, my kids clearly thought I was crazy and soon lost interest. Nearly everybody else has no interest either so they have plenty of company. There are certainly good reasons why very few people, effectively nobody, eat wild gooseberries around here. There is yet, however, no supermarket substitute for the uncommon and complex depth of flavor these wickedly spiny little berries hold. 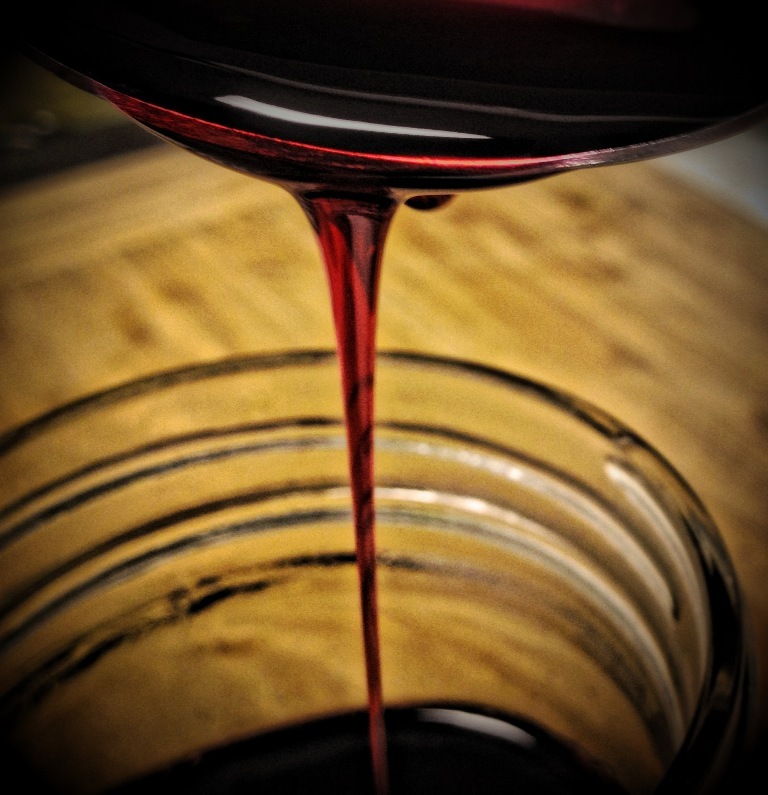 And in that deep burgundy, wild pure juice may be found a reservoir of traditional, natural wealth that perhaps has not been devalued and rendered obsolete by the 24/7 cornucopia of postmodern civilization. This entry was posted in Santa Barbara County and tagged Backpacking, Camping, Foraging, Gooseberries, Hiking, Los Padres National Forest, Nature, Outdoors, Santa Ynez Mountains, Wildcrafting. Bookmark the permalink. Jack: thank you for another interesting post. Our gooseberries are on very thorny bushes but the plants are just hairy – those are real beasts! You’re right about the size/flavour relationship of commercial versus wild fruits – no comparison – the taste is far superior for any wild fruit I can think of! Hey Carol. Are those the green berried type? I’m going to Scotland in a week. Going to do some “hill walking” over there, as they call hiking. I wonder if anything like that will be in season. Yes they are green. Good luck with the weather in Scotland – it’s a bit ‘up and down’ at the moment. I just got rained out of there last weekend on a hillwalking trip. I’m going to be up there next week too on the Isle of Skye. I’m not sure whether they get gooseberries in Scotland or not. We don’t see many around here and wild ones are fairly rare. You won’t see them outside of the fairly suburban areas anyway as the countryside is too infertile to grow much elsewhere. That’s why there’s so much heather. While camped at the Margaret Lakes in the Sierra years ago, we met some through hikers on a long trek, and we gave them some excess food items that we didn’t really need. They reciprocated by giving us a good size ziplock bag of wild currants that they had laboriously harvested. Though I had picked a few at times, and liked the taste alright, I had never taken the time to pick such a large amount. Soon we were adding them to cereal, oatmeal, and just eating them out of the bag; by desultorily eating just a few at a time previously, we hadn’t appreciated how good they were in their aggregate. Jack, great blog. I don’t know anything about Gooseberries, but it reminds me, as a boy many years ago, of eating wild huckleberries in the woods and hammocks of N, Florida. There was always something good to eat in the woods. Sounds good. I love me a good huckleberry! Didn’t know they grow in Florida. Nice post Jack. We grow a few gooseberry plants (different variety than what you show in your thread) in our yard and I’ll admit to having never taken the effort to try the fruit right off the plant. In addition to some varieties having the spiked fruit, some ribes varieties have the stalks and branches of the plant covered in the thickest, prickliest 1/4″- 1/2″ long thorns rendering it almost impossible to get close enough to the plant to pick the fruit. They can make blackberry or wild rose brambles seem mild. Hey Nico. I think this type of gooseberry has great flavor. I haven’t tasted other varieties. I make syrup using the whole berry spiny skin and all, and that imparts an intense earthy sort of flavor which is quite different than eating the fresh berries. They might be an acquired taste that way, but I really like it. I live part time minutes from you ( and Nyerges is only a few hours away.